Affordable housing is a cornerstone of the Atlanta BeltLine vision, intended to support a diverse workforce and ensure the Atlanta BeltLine’s economic, cultural, and health benefits accrue to people of all income levels. Our goal is to create 5,600 units of affordable workforce housing over twenty-five years. To date, $12.5 million has been dedicated to affordable housing: providing dollars to homebuyers through down payment assistance, funding for land acquisition for future affordable housing, and incentives to developers to build affordable housing. Learn more about our policies and programs. 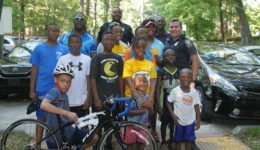 Supported by Atlanta BeltLine, Inc. The City of Atlanta intentionally incorporated affordable housing through the legislatively-mandated goal of creating 5,600 affordable workforce housing units in the Tax Allocation District (TAD) over the life of the program. Between 2005 and the end of 2017, there have been 2,565 affordable workforce units created within walking distance of the Atlanta BeltLine (this includes those in the Atlanta BeltLine Planning Area created by ABI, Invest Atlanta, the Atlanta Housing Authority, and the State Department of Community Affairs. As of the end of 2017, three distinct sites are controlled by developers who are actively planning and assembling financing for over 300 affordable housing units. Over the next three years, ABI will invest more than $15 million to support an additional 425 to 600 units. 822 affordable units in the TAD supported by Invest Atlanta and ABI (target 5,600). 1,311 affordable units in the TAD and Planning Area supported by Invest Atlanta and ABI. 1,521 affordable units in TAD supported by Invest Atlanta, ABI, Atlanta Housing Authority, and Dept. of Community Affairs. 2,565 affordable units in TAD and Planning Area supported by Invest Atlanta, ABI, Atlanta Housing Authority, and Dept. of Community Affairs. 11,343 residential housing units in the Tax Allocation District (target 28,000). Though overall housing development around the Atlanta BeltLine is strong, our ability to meet the project’s goal of 5,600 affordable workforce housing units requires enhanced or new tools and strategies. In order to reach the Atlanta BeltLine’s ambitious goals, we welcome the opportunity to work closely with key public and private partners on programs, policies, and funding that will make affordable housing a realistic opportunity for all who wish to live in and around the Atlanta BeltLine. We invite others to join us in making Atlanta BeltLine neighborhoods affordable for all. Inclusionary Zoning requiring developers building ten or more new residential rental units within the Atlanta BeltLine Overlay District to set aside units for affordable housing (more details under the Policies & Programs tab above). Centralizing information on tax exemptions for homeowners; affordable housing opportunities through ABI and Invest Atlanta partnerships (see Resources tab above). Homeowner education workshops designed to make sure existing homeowners in Atlanta BeltLine neighborhoods are equipped to take advantage of available resources to stay in their homes or knowledgeably evaluate opportunities if they are considering selling (see Resources tab above) . Pursuing key strategies and projects in accordance with the Integrated Action Plan. In 2015, ABI completed an Integrated Action Plan (IAP) to determine how to best achieve the 2005 Redevelopment Plan’s ambitious economic development and housing goals. The approach of the IAP is practical and action-oriented. It concentrates on fiscal years 2016 to 2020 while establishing a longer-term general framework through 2030. Read more and download the Integrated Action Plan. In 2015 and 2016, Atlanta BeltLine, Inc. partnered with the Federal Home Loan Bank of Atlanta on the Housing Initiative Program (HIP), which provided funding for downpayment assistance and owner-occupied rehabilitation for homes along the Atlanta BeltLine corridor. After two years of success, the program reached completion. Today, there are other resources to explore for downpayment assistance and owner occupied rehabilitation. If you are interested in downpayment assistance, please see Invest Atlanta’s homebuyer incentives here. If you are interested in owner occupied rehabilitation, please see a list of non-profit organizations participating in the Home Repair Network here. Johna bought her one bedroom, 1.5 bath home last year with downpayment assistance from the Atlanta BeltLine Housing Initiative Program. Read more about her successful home purchase with downpayment assistance. The Hodges Family discuss how they were able to by their home through the Atlanta BeltLine’s partnership with the Federal Home Bank of Atlanta. In addition to transit, trails, and parks, a centerpiece of the original Atlanta BeltLine vision is creating affordable housing all along the 22-mile corridor. To that end, numerous steps have been taken to advance opportunities. This webpage offers an overview of our programs for those wishing to learn about affordable housing efforts in more detail. The transformative nature of the Atlanta BeltLine will impact housing availability and affordability in and around the corridor. In anticipation of changing realities, 20% of net TAD bond proceeds are reserved for workforce or affordable housing. BAHAB is designed to make recommendations for maximizing the use of tax allocation dollars. In November 2017, the Atlanta City Council unanimously passed legislation sponsored by Councilmember Andre Dickens to require developers building ten or more new residential rental units within the Atlanta BeltLine Overlay District to set aside units for affordable housing. The legislation specifies that a developer must set aside at least 10 percent of units for households earning 60 percent area median income (AMI) or less, or 15 percent of units for households earning 80 percent AMI or less. This legislation is one way to help ensure that areas around the Atlanta BeltLine remain affordable and accessible to all of Atlanta’s residents. In 2015, ABI completed an Integrated Action Plan to determine how to best achieve the 2005 Redevelopment Plan’s ambitious economic development and housing goals. The approach of the IAP is practical and action-oriented. It concentrates on fiscal years 2016 to 2020 while establishing a longer-term general framework through 2030. In 2012, Atlanta BeltLine, Inc., the Atlanta BeltLine Affordable Housing Advisory Board, and Enterprise Community Partners developed an affordable housing strategy for the Atlanta BeltLine. The study identified the existing and future inventory needed for affordable housing. It also created tools and financial models for developers to build affordable housing along Atlanta BeltLine. Through the end of 2017, this funding, in conjunction with Invest Atlanta, has helped create 1,311 affordable housing units in the Atlanta BeltLine Planning Area. Throughout the TAD, 11,343 housing units have been created. The Atlanta Land Trust Collaborative (ALTC) was created to maintain affordability in neighborhoods at risk for displacement and gentrification as a result of the Atlanta BeltLine development. The Atlanta BeltLine Partnership, the Atlanta Housing Association of Neighborhood-based Developers (AHAND) and the Annie E. Casey Foundation led more than 30 public, private, non-profit, and community organizations for more than two years to bring the ALTC into existence in December 2009. ALTC brings needed development expertise and capacity with a focus on permanent affordable housing and transit oriented development. Learn more. We archive important documents relating to our affordable housing initiatives. If you are unable to locate a particular document, please contact us for assistance. Atlanta BeltLine, Inc. Affordable Housing Working Group Final Report – August 2018 Atlanta BeltLine, Inc. convened a panel of housing experts from public, private, and nonprofit sectors to make key recommendations to support ABI in reaching its goals to create and preserve affordable housing around the Atlanta BeltLine, while supporting the City’s One Atlanta vision and other City design and community frameworks. Mixed Income Transit Oriented Development Strategy ABI, BAHAB, Enterprise Community Partners, and Bleakly Advisory Group, Inc. together developed a series of recommendations to implement Mixed Income Transit Oriented Development. Download the presentation given to Atlanta City Council in March 2013. Lofts at Reynoldstown Crossing Case Study Detailed report about the Lofts at Reynoldstown Crossing project. BeltLine Affordable Housing Advisory Board 2010 Annual Briefing Presentation that outlines BAHAB's guiding principles, framework, components and target audience. Recaps BAHAB's work plan and progress in 2010. Highlights accomplishments and future plans. Atlanta BeltLine Affordable Housing Trust Fund Developer Grants Application for funding for Multi-Family and Single-Family Developer Grants. Grants are available to Multi-Family Developers from the BeltLine Affordable Housing Trust Fund to finance multifamily developments along the Atlanta BeltLine. BeltLine Affordable Housing Advisory Board Affordable Housing Trust Fund Recommendations BAHAB's policy recommendations to BAHTF, complete with detailed rationale and supporting appendices. BeltLine Affordable Housing Advisory Board Statement of Guiding Principles BAHAB is a citizens advisory board was created by the City of Atlanta in connection with the BeltLine TAD and outlines its guiding principles in this document. BeltLine Affordable Housing Advisory Board Bylaws BAHAB is a citizens advisory board was created by the City of Atlanta in connection with the BeltLine TAD and outlines its bylaws in this document. ABI contributed $1.5 million to the development of Reynoldstown Senior Residences (70 homes) from the BeltLine Affordable Housing Trust Fund. This complex has created and preserved affordability for low-income and very low-income seniors. It has enabled seniors to remain in or move into a walkable, historic neighborhood near the southern extension of Eastside Trail. All homes are currently occupied, but to inquire about the waiting list, please visit Mercy Housing’s website for lease information. Interested in purchasing a home near the Atlanta BeltLine? Atlanta BeltLine, Inc. offers a home search feature with the ability to search homes for sale in all price ranges. Invest Atlanta also offers downpayment assistance resources - please see the blue sidebar. The Housing Initiative Program that offered downpayment assistance and rehabilitation assistance is no longer available. If you are looking to buy a market-rate home along the Atlanta BeltLine, the links below will take you to home searches without a purchase price limit. Many of these homes will fall outside of the financial limits associated with downpayment assistance programs. ABI is providing these home searches as a tool to help citizens search for real estate for sale near the Atlanta BeltLine, but does not provide advice nor act as a broker. Interested homebuyers will need to work with their own real estate agents and lenders. Happy house hunting! Search Atlanta BeltLine homes for sale in the northeast. Search Atlanta BeltLine homes for sale in the northwest. Search Atlanta BeltLine homes for sale in the southeast. Search Atlanta BeltLine homes for sale in the southwest. Invest Atlanta, the redevelopment arm of the City of Atlanta, offers additional resources for those seeking to buy a home. See their page dedicated to homebuyer incentives. ABI completed the Lofts at Reynoldstown Crossing in 2012. 28 units were sold as affordable homes, with three units going to educators and first responders as part of the Atlanta Community Land Trust. The lofts are located at 890 Memorial Drive SE, Atlanta, GA 30316 and are immediately adjacent to the Eastside Trail in Reynoldstown. Are you looking to rent an affordable apartment on or near the Atlanta BeltLine? This webpage is dedicated to connecting you with specific developments to whom we have provided funding in order to preserve affordability. Please note that Atlanta BeltLine, Inc. (ABI) does not control any residential rental properties. Please contact the below apartment complexes directly. We are unable to answer any questions about availability. To search for rental housing, including all state-funded affordable housing properties, in the city of Atlanta and Atlanta Beltline, please visit the Georgia Housing Search website. There are many options for living along the Atlanta BeltLine for a variety of incomes. Below is a list of affordable housing options and information to learn more about leasing opportunities. This list is limited to apartment complexes in which Atlanta BeltLine, Inc. (ABI) and Invest Atlanta have supported affordable housing. ABI contributed $1.5 million to the development of Reynoldstown Senior (70 homes) from the BeltLine Affordable Housing Trust Fund. This project is scheduled for completion in fall 2016. Please visit Mercy Housing’s website for lease information. AMLI Ponce Park is located in the historic Old Fourth Ward neighborhood and is situated near the Atlanta BeltLine, Ponce City Market, Midtown, Downtown and more dynamic Atlanta Neighborhoods. AMLI Ponce Park is a LEED Platinum certified community. One of the many benefits of revitalization of communities along the Atlanta BeltLine has been the growing investment into those communities and new housing initiatives. The Atlanta BeltLine is committed to keeping residents informed of financial opportunities that help making living along the Atlanta BeltLine affordable for everyone. There are a number of ways to qualify for various exemptions for housing along the Atlanta BeltLine. The basic homestead exemption results in an annual savings over $800. Homeowner must be a City of Atlanta or Fulton County resident and be the primary resident (as of January 1st) of the home to which the exemption will apply. Senior exemptions increase Basic Homestead savings by over $200, for a total annual savings of over $1,000 (savings vary based on income). Homeowner qualifications are the same as the Basic Homestead Exemption, plus the resident must be 65 or older before January 1st, and cannot have a yearly net income exceeding $40,000. This tax relief freezes the assessed value of the residential property based on the previous year’s value. This frozen value will remain as long as the eligible senior occupies the residence. Homeowner must be a resident of the City of Atlanta, 65 years or older, and annual household income cannot exceed $39,000 for the preceding taxable year. Savings are based on home value, and are significant. Homeowner must be the surviving spouse of a firefighter or peace officer killed in the line of duty, and must reside at the property to which this exemption will apply. In the fall of 2016, the Atlanta BeltLine Partnership partnered with Home Place Consulting to provide a series of homeowner empowerment workshops designed to make sure existing homeowners in Atlanta BeltLine neighborhoods are equipped to take advantage of available resources to stay in their homes or knowledgeably evaluate opportunities if they are considering selling. The workshops were very well attended and additional free workshops are planned for the spring of 2017. Learn more and check out upcoming workshop dates. Thank you to Citizens Trust Bank for their sponsorship of the upcoming 2017 workshops. Atlanta BeltLine, Inc. contributed $800,000 to the complete renovation of Stanton Oaks in Peoplestown (43 homes). Located just south of Turner Field on Hank Aaron Drive, this fully renovated housing complex is on the site of the former Boynton Village Apartments. If you are interested in downpayment assistance, please see Invest Atlanta’s homebuyer incentives here. If you are interested in owner occupied rehabilitation, please see a list of non-profit organizations participating in the Home Repair Network here. Affordable housing along the Atlanta BeltLine is a shared effort and is only possible with the help of partners. As the redevelopment arm of the City of Atlanta, Invest Atlanta oversees the Atlanta BeltLine TAD and collaborates on housing efforts. Through the end of 2016, Invest Atlanta and ABI have helped to create 1,115 affordable housing units in the Atlanta BeltLine Planning Area and 785 in the Tax Allocation District. Learn more about Invest Atlanta. ABI partnered with Enterprise on the Affordable Housing Strategy (MITODIS), which was released in 2013. Enterprise’s mission is to create opportunity for low- and moderate-income people through affordable housing in diverse, thriving communities. Enterprise is a national organization with a local presence and deep expertise in catalysts for systemic change: impact capital, innovative solutions on the ground and transformative public policy. Learn more about Enterprise. The Atlanta Land Trust Collaborative (ALTC) was created to maintain affordability in neighborhoods at risk for displacement and gentrification as a result of the Atlanta BeltLine development. The Atlanta BeltLine Partnership, the Atlanta Housing Association of Neighborhood-based Developers (AHAND) and the Annie E. Casey Foundation led more than 30 public, private, non-profit, and community organizations for more than two years to bring the ALTC into existence in December 2009. ALTC brings needed development expertise and capacity with a focus on permanent affordable housing and transit oriented development. Learn more about the Atlanta Land Trust Collaborative. ABI works closely with Habitat for Humanity to rehabilitate homeowner’s houses along the Westside Trail to make them safe, warm, and dry. This initiative took place in 2015 and 2016 as part of a partnership with the Federal Home Loan Bank of Atlanta. Atlanta Habitat for Humanity partners with working families, sponsors, and communities to build affordable, green, quality homes and to provide support services that promote successful home purchase and ownership. Learn more about Habitat for Humanity Atlanta. ABI also works closely with HouseProud Atlanta, Inc. on the owner-occupied rehabilitation program to help make critical repairs to homeowner’s houses along the Westside Trail. This initiative took place in 2015 and 2016 as part of a partnership with the Federal Home Loan Bank of Atlanta. HouseProud’s program provides no-cost repairs to low-income seniors living in the greater downtown Atlanta neighborhoods. The primary goal of HouseProud is to keep homeowners warm, safe and dry in their existing homes. Learn more about HouseProud. Atlanta BeltLine, Inc. (ABI) has released the Affordable Housing Working Group Final Report, a guide for creating and preserving affordable housing around the Atlanta BeltLine. To support the development of a comprehensive housing strategy, ABI convened a panel of experts from the public, private, and non-profit sectors to serve as the ABI Affordable Housing Working Group. To make a wider impact on affordability in the city, ABI must rely on strong alliances with strategic partners both within the TAD and the broader Planning Area. These alliances formed the foundation of The Working Group, who established eight key recommendations designed to achieve these goals based on policy, zoning, and capital strategies. Download the full housing report. Read blog post for more details. For questions regarding production, preservation, and financing of affordable housing along the Atlanta BeltLine, please contact Atlanta BeltLine, Inc. at (404) 477-3003 or info@atlbeltline.org.